In a high scoring match at Feroz Shah Kotla Delhi, between Delhi Daredevils and Royal Challengers Bangalore only one man was the center of attraction it was Chris Gayle. 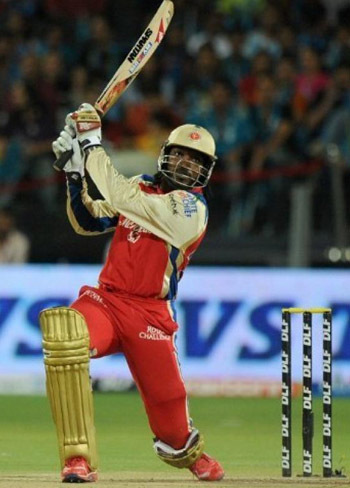 He made an unbeaten 128 runs hitting 13 sixes and 7 boundaries of just 62 balls. No ball or no bowler was left , playing along side him was Virat Kohli who also made an unbeaten 73 runs allowing RCB to make 215 runs by the fall of just one wicket in 20 overs. In reply, the main hitter from DD David Warner once again fell to the short ball and was out early, later it was Rao and Ross Taylor who made some quick runs allowing Delhi to make a decent total of 194 runs.Still the DD side lost by 21 runs, Chris Gayle was announced man of the match. Here is the full score card to give you the complete idea of the match.